The following article will give you a comparison between newly launched Tablet PC's Asus Nexus 7 and Lenovo IdeaTab A2107. Both the handheld devices are new in the market and most of the users struggle to choose the best one. Therefore, following comparative study will help you to take proper decision with regard to the above mentioned Tablet PC's. The Asus Google Nexus 7 Tablet PC is launched in India and everyone is in dilemma on how to choose a better tablet irrespective of the brand name. This tablet is now available in India and it is packed with lots of features which certainly attracts more number of users. On the other hand Laptop and Desktop manufacturing giant – Lenovo has also decided to step in to the Tablet PC market and their entry is in style as well. Since, their Laptops and PC are of high quality, so is their new product which is all set to offer a great service and attract more number of users as well. In this way both the devices, Asus Google Nexus 7 and Lenovo IdeaTab A2107 are both have a great fan following since they deliver a quality service with lots of features. The processor of Asus is of the type Nvidia Tegra 3 which has a quad-core 1.2 GHz and it also has a powerful graphical processing unit (GPU) which is of the type ULP GeForce. On the other hand, Lenovo IdeaPad A2107 has a processor of the type ARM cortex A9 and it also has a GPU of the type PowerVR SGX531. Both the tablets have whopping 1 GB of RAM and due to internal components the Asus stands taller than that of Lenovo IdeaPad A2107. Hence, the Asus tablet can be preferred over Lenovo tablet with respect to the gaming features. While buying a Tablet PC, every user aims towards large memory storage and that is why the Asus and Lenovo have added striking memory features within them. There are two options to look about the memory features of any Tablet PC and they are internal and external memory storing capacity. Here, the internal storage capacity of Asus Nexus 7 tablet can be of 16 GB or 32 GB and the users can order as per their budget. But if the user aims for lower internal memory storage than 16 GB then Lenovo is there to help. In Lenovo IdeaPad2107, the users can choose between 3 options of memory storages. In Lenovo Tablet PCs, there are options like 4GB, 8GB and 16 GB of internal memory storages whereas in the Asus Nexus 7, there are only two options available. The next important thing about any tablet PC is that it should possess an external memory storage facility. Unfortunately, Asus Nexus 7 lacks in this feature whereas the Lenovo tablet sports an external memory slot which can support up to 32 GB data storage with the use of a microSD card. In this way, with respect to memory storage Lenovo stands taller in front of Asus Nexus 7. Right now the network support in India is developing and most of the areas lack to offer Wi-Fi connectivity. Therefore, the tablet users are aiming for a 2G or 3G SIM card supporting devices that can offer them internet connectivity as and when required. Unfortunately, Wi-Fi feature is available for free only in select areas and most of the Wi-Fi connections are being made secure so that no one can access the Internet facility without permission. In this way, the Asus Tablet supports only Wi-Fi connectivity which certainly restricts the users, because it lacks in the other network support like 2G or 3G SIM card. Right now most of the users access internet facility via GPRS and EDGE networks. Hence, Lenovo has rightly spotted out this thing and their Lenovo IdeaPad A2107 Tablet PC supports a Dual SIM feature where the users access internet via 2G and 3G network connectivity.In this way, Lenovo Tablet PC has again out shown the Asus Google Nexus 7 tablet with respect to network support feature. Now days, the Android OS 4.0.3 is popular amongst all the android fans and Lenovo Tablet has done a great job by incorporating it in their IdeaPad A2107 Tablet PC. On the other hand, Google Nexus 7 comes with an Android OS 4.1 which can be upgraded to only Android OS 4.2.1. The important thing is that all the tablet customers' aim towards a tablet pc that has the latest and popular operating system. Therefore in terms of operating system, the IdeaPad A2107 is again ahead of Asus Google Nexus 7. It seems that Google will also look into this feature and they might release an upgraded version of Asus Nexus 7 tablet in near future. In terms of display properties, Google Nexus 7 has a picturesque screen which supports a capacitive touch-screen feature and its screen is made up of LED Backlit type which has a resolution of 800 by 1280 pixel. On the other hand, Lenovo IdeaPad A2107 has a TFT display screen and its resolution 600 by 1024 pixels. The tablet customers will get attracted towards the stunning display of Google Nexus 7 but Lenovo also delivers a clear crisp display screen. Therefore, in terms of display properties, Asus Tablet stands taller than that of the Lenovo IdeaPad A2107. In terms of camera features, the Asus has only primary camera which is of front facing type and it has a resolution of 1.2 Megapixels. This primary camera can be used to record videos and also for the video calling feature as well. Amazingly, the Lenovo IdeaPad2107 has primary as well as secondary camera. The secondary camera has a whopping 3.15 Megapixels camera which is capable of capturing images of resolution 2048 by 1536 pixels. Using this camera one can certainly shoot videos and Geo-Tagging feature at help as well. The front facing camera is of VGA type and it is specifically designed to support a video calling feature. The Asus Nexus 7 tablet has a battery backup of more than 8 hours only because it has a non-removable battery of 4325 mAh. So it is said that this tablet can work for up to 10 hours if only internet surfing feature is running on it. Lenovo has a lower battery backup which is near about 7 hours. Similar to Asus tablet, if only internet surfing is being done using Wi-Fi; this IdeaPad A2107 can last longer than 7 hours. The striking feature of this Lenovo tablet is that it can run the Java language programs via a MIDP emulator. 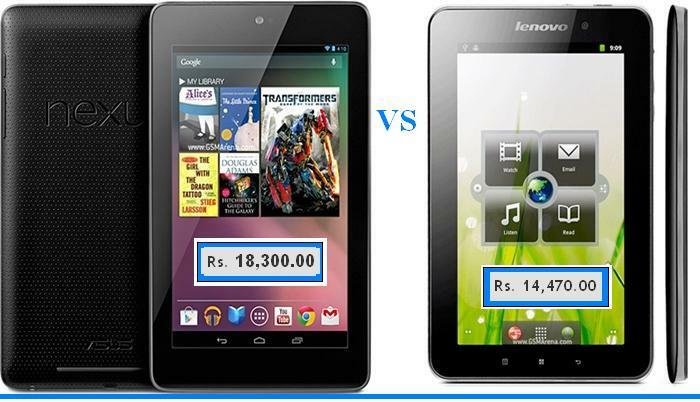 This feature is not present in Asus Tablet and hence, the Lenovo rises above it this time. Other supporting features for both the tablets are like GPS, accelerometer and proximity sensor. Hence, considering the above specifications users should buy a tablet which will suite their budget and have more number of features as well.